Jill has been Professor of Production Economics at the University of Huddersfield since January 2015, and Dean of Huddersfield Business School since October 2016. She started her career at British Aerospace, Warton Division, before working as lecturer, senior lecturer and finally Reader in Production Economics at Lancaster University. Jill’s core research examines organisational efficiency using frontier estimation techniques. From a combination of widely-cited journal publications and two highly influential books, Jill has gained a prominent national and international research reputation in education economics. Her early work, including the book Performance Indicators in Higher Education (1990), influenced the manner in which league tables are constructed, from an output approach to the now standard value-added approach. As a consequence, Jill has worked on efficiency issues with, for example, the Department for Business Innovation and Skills (D/BIS), the European Union, the Kuwait Institute of Scientific Research and the Swedish National Audit Office. She has also been invited to speak on education efficiency at a number of venues including the Swedish National Audit Office (2010), the Beijing Forum (2012), Beijing Normal University (2013), the Annual International Conference of the Association of Higher Education Researchers, Moscow (2013), and the 5th Workshop on Efficiency and Productivity Analysis at Catholic University Porto (2015). Most recently she co-organised a conference on Efficiency in Education at the Work Foundation, London (19th to 20th September 2014) and is currently editing a special issue of the Journal of the Operational Research Society on Efficiency in Education. 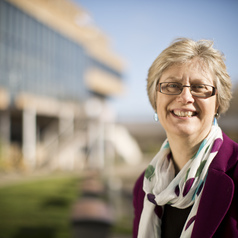 She has won awards for her teaching including the Lancaster University Sir Alastair Pilkington Teaching Prize in 1991 and a National Teaching Fellowship in 2011.